Patrick Mobley, the owner of Mobley Plant World, wanted to replace all his Styrofoam trays for something that would last longer, in order to help save money, improve plant survivability and reduce waste. In 130 hoop houses in two locations in Georgia and Florida, Mobley grows over 500 million vegetable seedlings every year, including tomatoes and peppers. 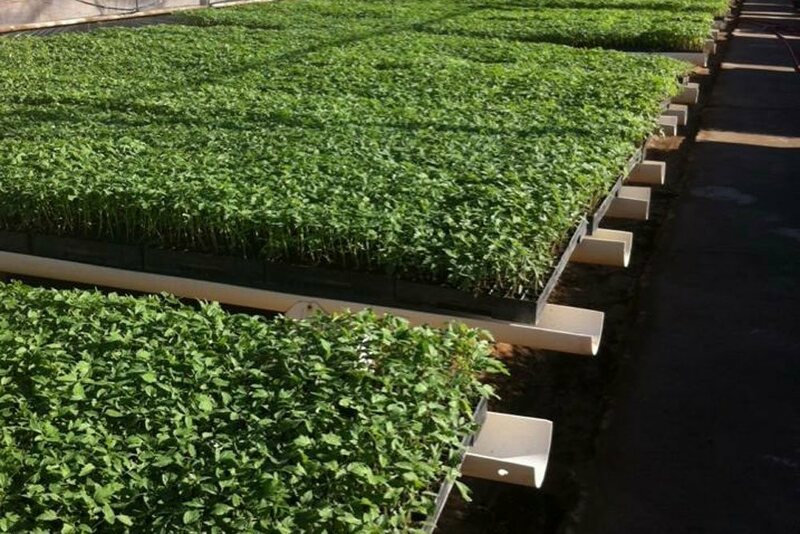 Due to the volume of seedlings grown and the wide range of crop, multiple trays were needed to create the most efficient and all-encompassing solution. We developed the 128 tray as an out and out replacement to fit the seeding machines that Mobley already had. This tray was developed to be tough, create much better roots and easier to pull plants – but still have the same cell volume and cell spacing. However, Patrick saw the opportunity to improve and increase the efficiency of his greenhouses further. In addition to the 128, we developed a 162 count tray to allow for more plants, but still keep the plant spacing very similar and the plant quality comparable. For his high-density crops, we then developed a 578 tray – using all our combined knowledge to ensure the plants would grow well, even when spaced so tightly. With Patrick and John Cooley working together (with many decades of horticultural experience between them), we designed extra features to get the very best out of the plants including octagonal cells, vented top surface, root training ribs and air-pruning drainage hole. We created technical drawings, then a prototype mold that consisted of just 4 cells with varying configurations of all the features like 1 rib, 2 ribs, square hole, round hole, etc. This facilitated quick and economical trials to determine the optimum cell design before creating a commercial mold. Once the best cell design was selected, we created a sample mold that creates small 4-cell sections of tray, but out of a similar material to the final product. These sections slot and glue together to create a life-size tray, that can then be trialed again, in situ in the real working greenhouse to get as close to future growing conditions for the tray as possible. After the trial, any tweaks still needed were actioned in the digital design, and once everyone was happy we began production on the actual mold. A few months later, the mold was in a factory in the south east USA and started producing trays. At every stage we worked closely with Patrick and his team, and the end result is a tray specifically designed to work with vegetable seedling growers. More plants in the same greenhouse footprint.